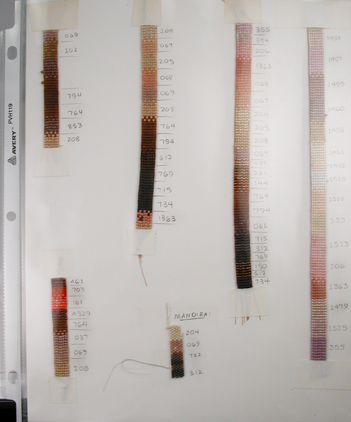 2011 Color Tip #2: Weave or string samples. Don’t skip over this post because the thought of making samples sounds like drudgery! I’m big on the discipline of planning ahead: sketches, samples, and test-runs are part of my design process. I do this for all my paintings. Because of their surface finishes, sample work is even more critically important in bead work. Beads are like living organisms: you can’t truly know how they’ll interact until you corral them together and watch what happens. I’ll say it again: YOU CAN’T KNOW HOW BEADS WILL VISUALLY AFFECT EACH OTHER UNTIL YOU WEAVE THEM TOGETHER. It’s impossible. I’ve been beading over 23 years and still make samples to learn from the beads themselves. The smaller the bead, the more true this is. When you weave together samples, you’ll see how they visually interact. Like siblings, some get along beautifully, while others were not meant to be strung side-by-side. Keep your samples for future referral. I keep mine in binders, so I can pull them out when necessary, and store them neatly when not in use. If you really want to improve the color in your jewelry, make and learn from samples. Study them carefully in all kinds of light: fluorescent, sunlight, tungsten. Sample making doesn’t have to take a lot of time, and it’s worth the effort, especially for more elaborate finished pieces. Learn more about color in my comprehensive color and beading book, The Beader’s Guide to Color. Great idea…..makes me wonder at myself for not thinking of this earler….you truly don’t know until they are in at least several rows…not to mention the color strips are beautiful on their own! Hi Trish – you are welcome for the push! Thanks for reading! Don’t you have to do the strips with the colors made up of your current project? I see you have the one of just Delica pinks. How does that help when it’s time to work pink into a project where they’re surrounded by other colors? I’m trying to amass Delicas now. Trying to figure out what to buy on a limited budget. Any suggestions for colors or finishes? Thanks!! I am SO sorry this took me so long to answer, Sally! Somehow I overlooked your post. You are right in asking how a strip of several shades on one color helps determine how it interacts with other colors. I make strips of one color in many shades, or a couple colors in many shades, and hold them against strips of other colors to see how the different colors interact. 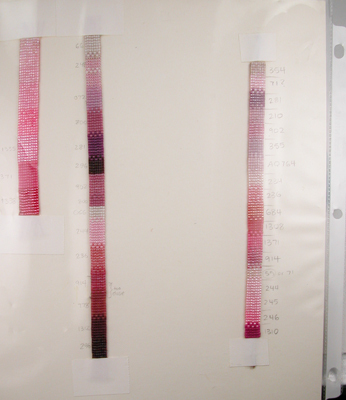 I also make strips of several different colors (in one strip) to explore the same thing. It all depends on the project I am working on. Often I choose the or so colors I might use, and weave a strip of just those colors,. And weave them in different positions. Example: I may weave a green next to a pink , then the same green next to the maroon I want to use, then the same pink next to a purple I may want to use. Whatever it takes to learn what I need to learn.